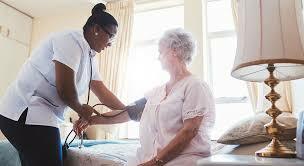 Should we hire home health or move to a senior community? Most people think they would rather bring in help and hire home health rather than consider moving to a senior living community. Is this truly the right answer? In this two part series, we will discuss the pros/cons of staying at home or moving to a senior living community. Bringing in help might sound like the easy solution. No need to uproot yourself and move somewhere. You enjoy your home, your neighbors and you’re comfortable with you daily routine. In the right situation, bringing in help could be the correct solution, especially if you have a short term issue, however if your situation is more longer term, you may want to rethink this option. It is important to think through the decision to not move and the impact (financially, socially and emotionally) this will have on you, your spouse and your family. First, let me state that there are some very good home health care companies in our area that are reputable, reliable and provide quality care. Unfortunately, there are equally companies that are not reputable and provide inadequate care. If you know you don’t want to move, you should do your research before a crisis occurs. Who’s going to change the light bulbs? A house is a living entity. There are many moving parts in a constant state of wearing down. Not only is it an expense to maintain your home; trying to quality workmen is a whole other challenge. Living in a maintenance-free senior living community, you make one phone call and the maintenance guy comes an fixes whatever needs to be fixed. You don’t need to be home or even better, to pay him! As you age, household repairs become more difficult to manage. Simple chores like changing light bulbs or rebooting your television cable box become monumental tasks. Unfortunately, people, especially the elderly, are vulnerable to unscrupulous vendors. You might be able handle everything today, however you need to think about the time when you or your spouse are unable. Chef-prepared meals or soup in a can? Meal preparation at home is a challenge as we age. Shopping and cooking are not fun anymore. Especially, if you are alone, meal time is a lonely time. Many times, someone doesn’t eat a nutritionally balanced meal because of the hassle of preparing it. Most home health aides are not chefs. They might buy some groceries and cook what they buy. There is not a menu of entrée choices or chef-prepared meals like you would enjoy at a senior living community. In addition, at a senior community, there is always someone to join you at your table. You will never worry about dining alone. Transportation becomes a major issue for people who stay at home. You may not be able to drive yourself and the home care aide may not be able to drive you. Ultimately, you don’t get out and you become very isolated. Transportation to doctors’ appointments, excursions to places of interest is included at a senior living community. If you are living at home and not able to get out; your life will revolve around your television. You have nothing in common with the home health aide, so you park yourself in your easy chair and watch Jeopardy and Wheel of Fortune. If you lived at a senior living community, your days (and nights) are full of interesting and fun activities. There is card playing, lectures, concerts, excerise classes, movies and endless parties and celebrations. Like a cruise ship, you pick and choose which activities and excursions interest you. Personal hygiene is another issue for people who stay at home. People neglect to shower, brush their teeth, wear clean clothes or change their bed linens. Someone’s self-worth and dignity become lost. If you lived at a senior living community, the staff can assist you with these tasks including personal laundry and housekeeping. There is also an on-site beauty salon, barber shop and even a visiting podiatrist. There is social accountability since you know you are going to dine with other people which forces you to shower, get your hair done, and put on clean clothes. There is a limit to what services can be brought to you in own home. At a senior living community, you have access to on-site physical therapy where you can go multiple times during the week (and never worry about driving). They also have visiting doctors and on-site nurses that can check on you. If you were at home and had an emergency during the window of time when you didn’t have a health care aide, you could be in a life or death situation. In a senior living community, you have 24/hr. emergency response. By deciding to move to a senior living community, you can select where you want to live. If you stay in your home and try to manage with home health care and realize that 1) it’s too expensive or (2) it is not working for you; your options are now more limited and you might need to settle on a place that wasn’t your first choice. Some communities have acceptance criteria so if you wait for something to occur, you may not get accepted. You want to move before a crisis occurs, so you can enjoy the lifestyle of the community, meet new friends and have access to the many on-site services and amenities. There are times when a promise has been made to a parent or a spouse that a move to a senior community will never take place. These promises are many times made without fully understanding the impact this will have (physically, emotionally and financially) on the spouse or family members. People also make these promises without researching other housing options and are basically unfamiliar with the many advantages of living at a senior living community. Being realistic and considering all the factors will remove any guilt and help create a better living arrangement for you or your loved one.